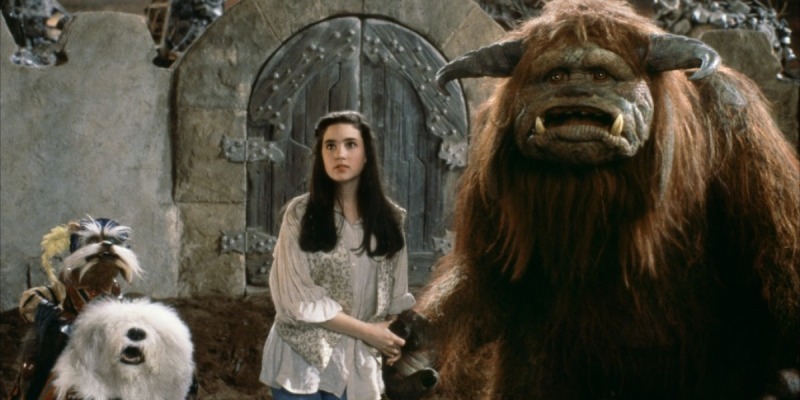 Labyrinth is the movie of the month for the LAMB, and seeing as it’s on one of my lists this is the perfect opportunity to cross it off. You can listen to the LAMBcast episode dedicated to the film here. It’s one of those films that I felt like I’d seen before – I think I’ve seen a few scenes or paused briefly passing through a room it was playing in – but in reality knew next to nothing about what was going on. It’s not a film that relies on a great deal of logic. 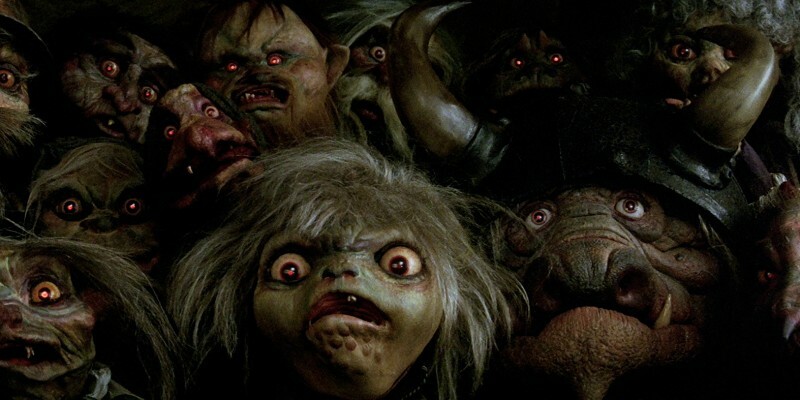 It’s the kind of story where a girl saying a particular set of words will summon a goblin king to her bedroom, and then suddenly she’ll be transported to the goblin realm without batting an eyelid or being at all surprised that she is no longer surrounded by her collection of teddy bears. 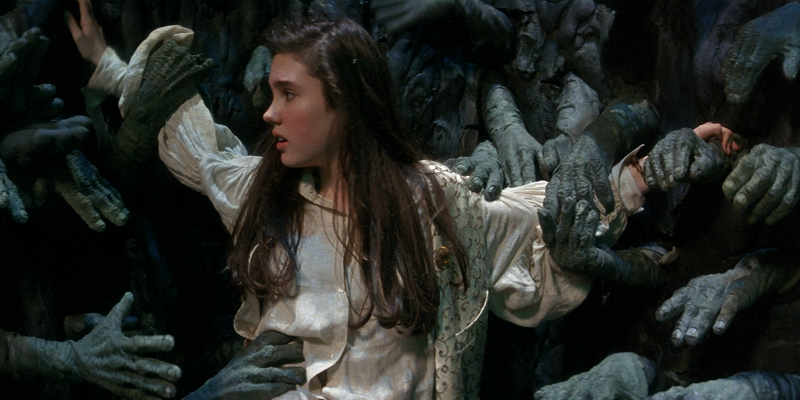 If anything, it’s this abundance of the absurd and illogical that makes Labyrinth work. On first viewing it’s utterly impossible to predict what will be lurking around the next corner. A pit full of hands that will form faces and help you up or down? A forest home to creatures who can remove their own heads? A one-eyed fox dressed as a knight, riding a sheepdog, guarding a bridge from trespassers? To list all the insane characters and situations present would take a full review, and would fall far short of doing justice to the creativity at work, predominantly masterminded by director Jim Henson and writer Terry Jones, of Monty Python notoriety. Had the whole film centred on these fantasy elements then I feel I’d have liked it a great deal more, but alas I found the core plot unsatisfying, especially upon its conclusion, which felt tacked-on and hurried. Granted, the whole thing is (in my opinion) a story told entirely within Sarah’s mind, with most of the creatures she meets represented by toys and knick-knacks within her room, so perhaps this lack of a succinct resolution matches the degree of storytelling her mind is capable of, but that feels like a stretch and a poor excuse for a film that didn’t know how to end itself. Most egregiously, throughout the film there is a running theme that Sarah should grow up and out her childish toys behind her, stop playing around and take some responsibility for herself, but some the very final conclusion this is thrown out the window in favour of a puppet dance party that left me beyond irritated. Similarly, the musical numbers added nothing for me but padding to the film’s run-time. I think there were four, and none of them added anything to the plot other than a brief distraction from it. I approved of the puppetry throughout, especially in the Chilly Down sequence, and the character design and development is phenomenal, so the film should be watched just to appreciate all of that, just don’t expect a satisfying conclusion. 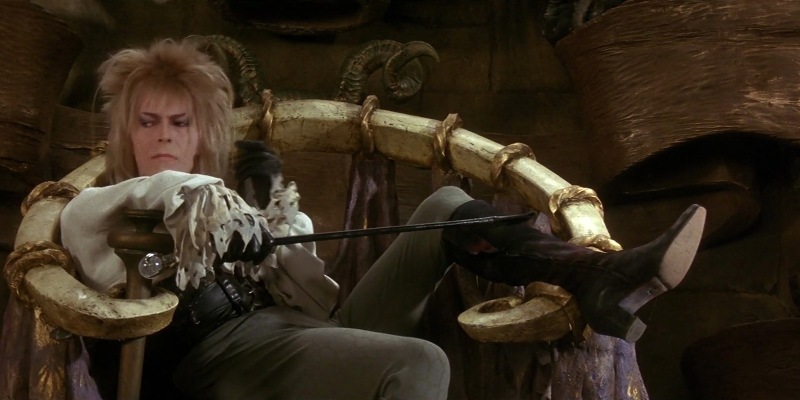 This entry was posted in 06/10, Choose Film, Empire Top 301, Lambcast, Podcast, Review, The List and tagged Brian Henson, Christopher Malcolm, Danny John-Jules, Dave Goelz, David Bowie, Frank Oz, Jennifer Connelly, Jim Henson, Kenny Baker, Kevin Clash, Labyrinth, Shelley Thompson, Steve Whitmire, Terry Jones, Toby Froud, Warwick Davis by jaycluitt. Bookmark the permalink.